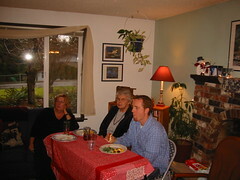 Yesterday, we were in Monroe at my nephew Aaron's house for the Bulthuis Christmas celebration. We all opened gifts from Mom which we had purchased ourselves, as well as gifts presented to her. It was fun catching up on eachother's lives. A new generation is emerging as Jorren has recently been joined by brother Caden and cousin Anika. The commotion eventually got to mom and she needed to retreat for a while to the quiet basement. It was great to have sister Ellen at our house for a couple of days. She is up from Sacramento for the holidays. She will spend the next week or so with mom in Lynden.